Who is the audience member that heckles Fozzie? 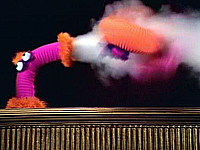 It could be Wally, the host from The Muppets Valentine Show making his only speaking Muppet Show appearance. 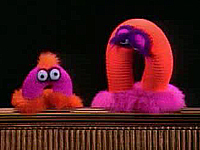 However he appears here without sunglasses and in other episodes of The Muppet Show, Wally is seen with sunglasses in the audience and dressed differently than the heckler. The personality doesn't quite fit with what had been established either. More likely, it's a cameo from Leo from the Muppet Meeting Films making his only Muppet Show cameo! Even though his partner Grump would come later, Leo had already been making his sales pitches in 1975 with his classic "Sell, Sell, Sell" routine and was featured in a pitch tape for CBS to persuade them to pick up The Muppet Show. The heckler's talent for wordplay is much more in keeping with Leo's character. This is the only first season episode to not contain an At The Dance segment. 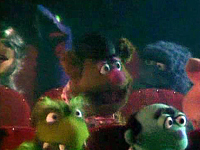 Some other interesting observations on that audience scene...Fozzie's act concludes when everyone leaves when he demands only Fozzie Bear fans remain in the audience and is dejected to find his cousin has left as well. However his cousin exits his seat even BEFORE Fozzie turns his back and counts to three. (Maybe he slipped out to the concession stand?) 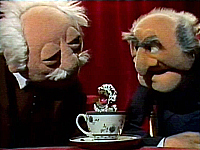 He's gone before Leo starts counter-heckling Statler and Waldorf. Also, Miss Mousey switches seats with Mary Louise between the two exchanges! Finally in regards to that audience, even though everyone leaves except Statler and Waldorf, they're all back in their seats to cheer on Ethel as she takes the stage and can be seen applauding at the end of her number (though this shot is one of the stock footage audience shots that's used throughout the season, complete with Wally with sunglasses and different outfit and Miss Mousey seated in another spot). They had apparently rushed back into their seats when they heard Ethel start her song from backstage. Brian Henson: "Hi, I'm Brian Henson. When I was a kid my father was so into gadgets... cars especially. And he had this tape that he used to play which was "How to Speak Mock Swedish". And he used to drive to work and I used to ride with him a lot. And he would drive to work trying to make a chicken sandwich in Mock Swedish or make a turkey casserole in Mock Swedish. It was the most ridiculous thing you had ever seen. And people at traffic lights used to stop and sort of look at him a little crazy." "But that was the roots of the character that would eventually become The Swedish Chef. And if you watch The Swedish Chef one of the most exciting things about it is the head is just speaking away and trying to follow the hands which are grabbing meat cleavers and throwing chickens over his head. To me the best part about the Swedish Chef is the more you don't understand him, the more you love him. Here is The Muppet Show." 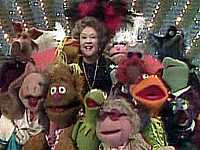 Miss Piggy plans to sing a medley of Ethel Merman's hits as a tribute. 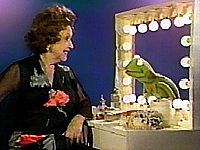 KERMIT: Why would anyone want to here you sing Ethel Merman's songs when Miss Merman is here to sing them herself? PIGGY: Well...since I've rehearsed them why don't I just do 'em and call it a tribute to Irving Berlin? WALDORF: That song had a nice beat! STATLER: No no, I don't want to eat. WALDORF: I said beat BEAT you old fool? Why don't you turn up your hearing aid? STATLER: There's going to be a raid?! Let's get out of here! Fozzie alerts Kermit that his agent will be paying him a visit later on. KERMIT: What does he want to talk about? KERMIT: Fozzie you don't have a contract. FOZZIE: THAT'S what he wants to talk about! 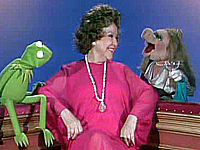 Kermit explains that several cast members wanted to sing a duet with Ethel so they've arranged a medley since she has introduced so many classic songs. MUSICAL NUMBER - "ETHEL MERMAN MEDLEY"
WALDORF: Wonderful! Wonderful! I remember Ethel Merman in the opening of "Panama Hattie". STATLER: You're old enough to remember Teddy Roosevelt and the opening of the Panama Canal! Irving Bizarre, Fozzie's agent arrives and is quite the short one. 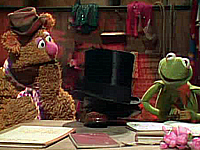 Fozzie has to prop him up on Kermit's desk for the two to negotiate and even then all we can see is a top hat over a pair of shoes! Even though Fozzie asked him not to, Kermit can't help cracking the "short jokes", but when Irving fires back at him, the frog shows he can dish it out but can't take it! Ethel points out to Hilda that there's a mouse in her dressing room. When Hilda replies it's the only place she has to change, Ethel wonder what kind of place she's stumbled into...and then meets Animal! UK SKIT: BALCONY - "DON'T SUGAR ME"
...And speaking of mice, in probably the weirdest UK skit of the season, Statler asks Waldorf what he takes in his tea. 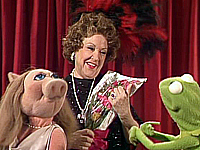 Miss Piggy interrupts the proceedings to offer Ethel Merman a toast and shills for singing tips in the process. Piggy may have won the battle of the high notes earlier, but Ethel wins the war of the divas by shattering Miss Piggy's glass with her voice. PIGGY: I, too, am a singer of note. KERMIT: Who knows? It's always flat! WALDORF: She and Kermit make a nice pair! STATLER: Well, she certainly is a peach! 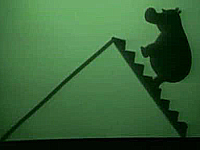 Confessing the cast's love mysterious love of puppetry, Kermit brings on guest puppeteer, Australian Richard Bradshaw. A peacock, mouse (what IS it with mice this episode? ), and hippo all take a turn on a playground slide. WALDORF: Hey look, there is more. STATLER: Oh good grief, they heard me. IRVING: Not bad looking for a pig...want me to handle ya? PIGGY: I already have an agent, Shortstuff! IRVING: I don't want to be your agent, I just wanna handle ya! Kermit introduces Fozzie as he hints to the audience that he's currently negotiating himself out of a contract as Fozzie peaks through and overhears. Fozzie faces a very tough crowd...his identical cousin in the audience performs his own jokes, Statler and Waldorf chime in and are counter-heckled by another audience member! Fozzie finally demands that he only wants to see real Fozzie Bear fans in the audience after he counts to three...everyone except for Statler and Waldorf exit the theater...including his cousin! After Fozzie essentially clears the house, it appears the contract negotiations are about to break down, however Kermit eventually relents and offers Fozzie ten times as much money as he's presently making. The only catch is Fozzie currently earns nothing. Ethel attempts to cheer up Fozzie by reminding him of the real reasons performers do what they do despite fickle audiences by singing "There's No Business Like Show Business"
MUSICAL NUMBER - "THERE'S NO BUSINESS LIKE SHOW BUSINESS"
Ethel continues to take her number onstage as other Muppets join in with female, male, and ensemble chorus lines. 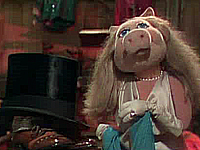 Ethel is presented with a dozen roses by Miss Piggy at the show's end. Contrary to her suspicions, they don't explode. STATLER: I wonder why I'm so itchy. WALDORF: Maybe the show's starting to get under your skin.